Along the coastline near Porskafjordur, Iceland, the shipwreck of Garðar BA 64. Shot with Lumix G7 converted to 850nm infrared with a Lumix 14-42 1/100 sec, f8, 200ISO. After I shot the 1st picture, I turned on my heels and saw the 2nd shot behind me. Garðar was launched in Norway in 1912, the year Titanic sank in the North Atlantic Ocean. It was named Globe IV and was equipped with both sails and a steam engine to use when the weather was still. It was specially reinforced to endure the harsh conditions of the Southern Ocean where it was used to hunt whales. Globe IV was sold to the Faroe Islands in 1936 where it got a brand new name and a somewhat less dignified role in the whale hunting business. 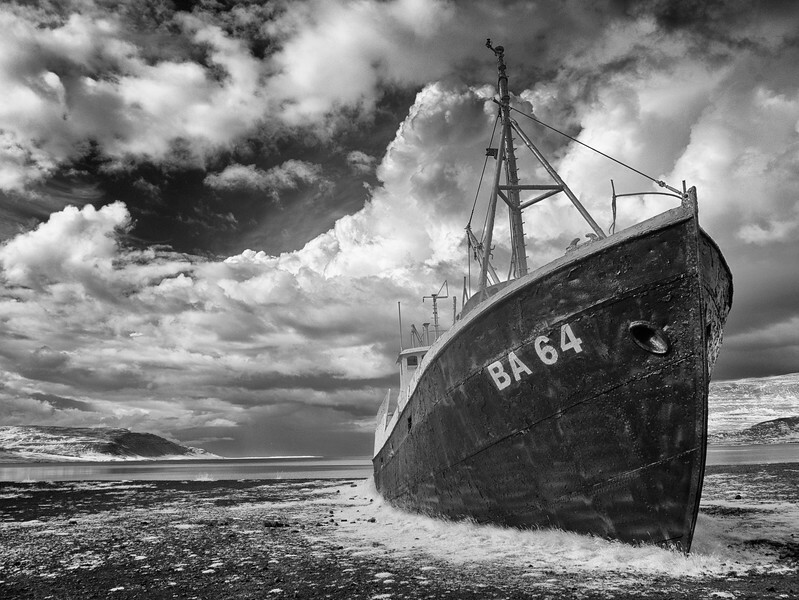 At the end of the second world war the ship was sold once again. This time to Iceland. Once here it was given an icelandic name, Siglunes SI 89, and the old steam workhorse which has powered it all those years was replaced with a 378 hp Ruston Hornsby diesel engine. The ship traded owners and names for number of years until 1963 it finally aquired the name it has today, Garðar. It was a good ship and served it’s many owners well for a long time.